📡 Internet required? No: you can play this app without Internet. 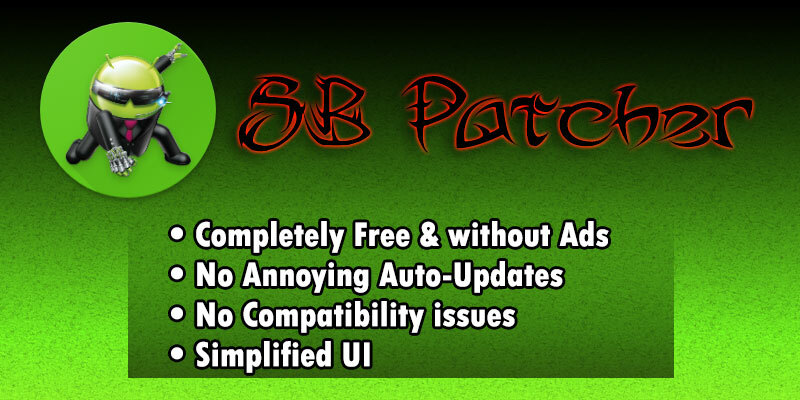 We're proud to share with you: SB PATCHER! 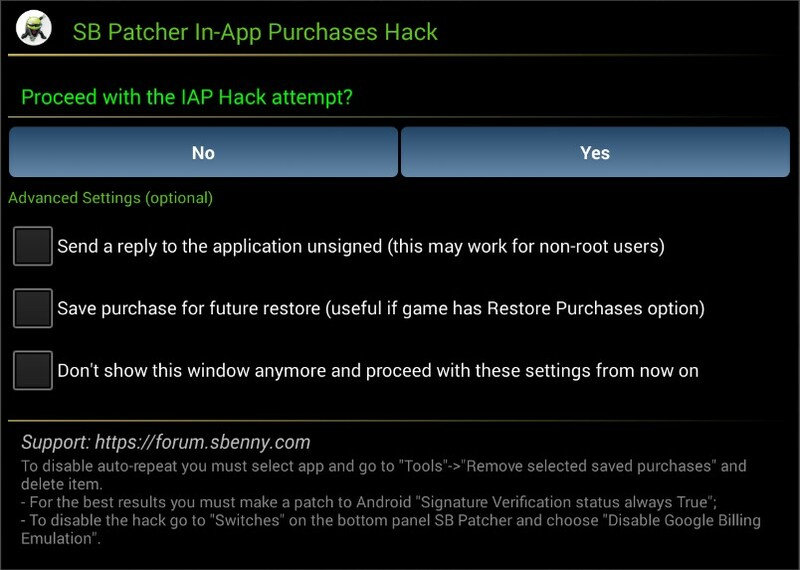 This is the first official beta of sbenny.com's attempt to tweak Lucky Patcher for our needs. SB Patcher is based on the popular Lucky Patcher , and is mostly aimed at overcoming a common problem affecting users who create or use patched apps, and in particular, In-App Purchases hacks. In facts, when you patch Android Apps, you have to keep in mind the version of the tool you used, because if the end-user will use a different version, it's more likely to not work on his device. Same obviously goes for players, which, vice versa, will have the downloaded hack not working either because the In-App Purchases list will be empty, or because after attempting the hacked purchase, it will not go through. With SB Patcher , you'll no longer have this risk, because this and any future updates will always be completely compatible each other. Being the first release, I tried to keep it as simple as possible, so most of the functions are unchanged, so if you're familar with LP, this app will work nearly in the exactly same way. Players will have a more brief explanation of the checkboxes before the IAP crack, and Modders will benefit of the non-intrusive presence of SB Patcher on their devices as it'll be faster and will not constantly check for updates, wasting your bandwidth. Please note, in order to install SB Patcher, Lucky Patcher must be uninstalled and removed from your device. We planned to make a stand-alone package but to avoid compatibility issues, we decided to not let both Lucky Patcher and SB Patcher be installed at the same time. Also, please note Lucky Patcher patches don't work with SB Patcher , and vice versa. I'm planning to tweak this app from time to time, in order to eventually add new features, tweak some settings or improve the UI further more. Also, being a beta release, it could have some bugs (no bugs known so far), so if you find any bugs or have any suggestions, kindly email us at [email protected]. Q: I get: "App Not Installed" error, what to do? A: Open Google Play, go to the settings at the left, and make sure "Play Protect" is turned off. Awesome stuff thank you ! Thanks SB for this, i used LP a lot but it can be confusing, this looks great. Wow this is awesome!! @Sbenny Finally!!!! Cool, I will give this a try. And ofc thank you! I'm pretty sure most players want to learn this or would like to see. The method this app patches the APK in order to try to provide the IAP crack is identical to what Lucky Patcher does (smali editing). The hack consists in an exploit which tries to generate a fake response to the IAP attempt requests, so if Lucky Patcher fails, SB Patcher will fail, too, because it means the developer of the app (Night of the full moon in your example) most likely fixed this security hole. Alternatively you could try selecting the first or the second checkbox when doing the In-App Purchase, as they give higher chances to have it work (if the developer didn't fully fix the security hole).